So, I find that a great portion of my ‘job’ as a radical unschooling parent is to be a major resource, provider, creator of experiences, encourager, etc. I am here to not only navigate through the world for them, but to encourage them to learn how to navigate when they are able, ready and willing. I tend to pick up a ton of resource materials in the process of all of that. Things that I find that think will be of interest to one or more of my kids, or something that may be something that sparks interests that lead to more interests…. 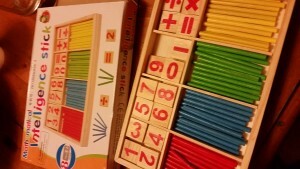 As such, I recently came across this Amazon deal called Mathematical Intelligence Sticks. At the time I purchased it, it was less than $5 (I see the price has gone up a bit since I have purchased it). It seemed like a great deal, and now that we have them…. well…. I kinda wish I had saved the $5 and took the kids out for ice cream or something. I had S(7yrs) and M(5yrs) in mind when I purchased them. They are always into all of the “stuff” I bring around the house. They are the two to scour shelves looking for something new to explore. I figured this would be a fun conceptual way of learning, or at the very least play around with numbers. Let me tell you…. it was truly not a needed item in our home. For one….. kids truly have to know their numbers 100% for these to be of any value. The numbers would be far more useful if they had marks or dots on the back that conceptually helped kids confirm their number knowledge. These are just numbers and sticks. And while I glanced at the deal and thought it would be awesome…. truly they are not. No need to waste the money to purchase them unless (1) your kid is truly already knowledgeable of numbers and their values, and (2) know their math signs. The box is marked for 3 years and up….. Uhhhmmmm….. No. This box is not intended for anyone other than a fluent reader who knows numbers. I am just as well off playing our other fun games and baking, and shopping with my kids for them to gain their number knowledge than I am with this now wasted $5 box of wood. Last but certainly not least for this evening….